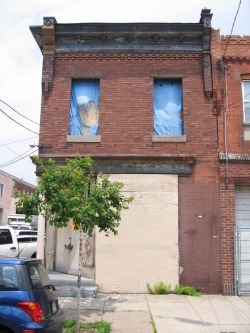 The incredibly long, arduous process of getting PLCB approval for the Lucky Old Souls jazz club in South Philly is now over, and we have succeeded in getting our final approval from the PLCB. The extensive renovations required on the building (vacant for 25+ years) will start this spring and we will be open before the end of 2011. To celebrate, Lucky Old Souls presents Jazz on Colorado Court, free outdoor neighborhood concerts every Saturday in May from 3-6:30pm, alongside the future home of the Lucky Old Souls on McKean St. between 17th & 18th. Food from Honest Tom's Tacos, Buttercream Cupcakes, Tyson Bees, & Little Baby's Ice Cream (2 vendors each week). Our initial application with the PLCB was filed in October 2009. In spite of overwhelming support in the neighborhood and the support of the Newbold Neighbors Association, a few neighbors filed protests. A hearing was finally held in August 2010. In January 2011, the PLCB finally approved the application. A few weeks later, in early February, one individual neighbor (a business owner and resident across the street) filed an appeal in the Court of Common Pleas. This was going to further delay things, while we waited for a court date and for the appeal to be resolved. Then, totally out of the blue, a few weeks ago, we were notified that this individual had withdrawn his appeal, clearing the way for things to move forward. The Philadelphia Science Festival is a two-week, community-wide celebration of science featuring lectures, debates, hands-on activities, special exhibitions and a variety of other informal science education experiences for Philadelphians of all ages. The week kicks off with the Science Carnival on the Ben Franklin Parkway on Saturday, April 16th beginning at 10am. There's a list of events taking place around South Philly, but if you're willing to hop on the bus or subway, the entire week's event lineup is within easy reach. Newbold Neighbors is creating a group for parents of young children in Newbold. Join us for our first meeting to meet neighborhood parents, discuss neighborhood related topics, and find define the role of this group in addressing local issues. Please feel free to invite any neighborhood parents not already of the list.